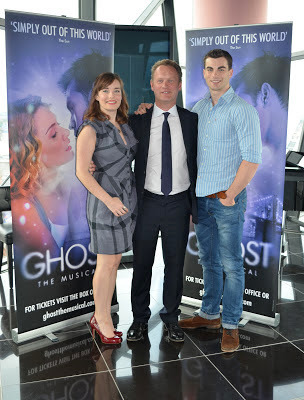 Fresh off of it's run at the Wolverhampton Grand Theatre this past fortnight, and garnering a 5 star rating from us here at (A)musings (click here for Kyle's full review), the superb Ghost the Musical made a pitstop at the opulent Laurent Perrier champagne bar in Birmingham on a fittingly drizzly Thursday afternoon (fans of the show will understand) for a launch event to promote it's run at the New Alexandra Theatre this coming December. 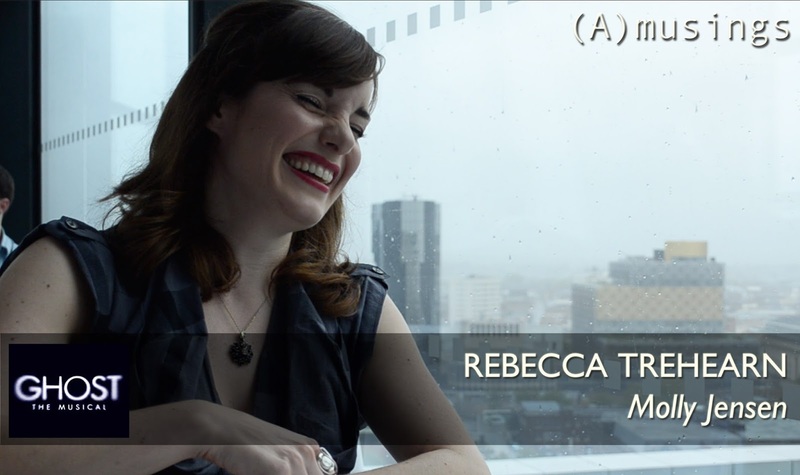 Well Rebecca, thank you very much for your time! We saw the show in Wolverhampton last week, but before discussing Ghost, I was just wondering if we could talk about yourself a little first, and how you got into acting and musical theatre. Was it something you always wanted to do? Yeah, it kind of was. I started very young because I grew up in North Wales, and singing and performing is very much a part of the culture there, I would say. There’s an annual competition called the Eisteddfod that kind of moves around the country, but basically you can do choral singing or solo singing or a specific Welsh form of singing, so I started competing as a singer there when I was 7 or 8, something like that, and then joined a local Am Dram group when I was 9 and I never really looked back. I did my first professional theatre job when I was 10 or 11, I can’t remember! But I’ve been doing it ever since... I have no other skills! (laughs). 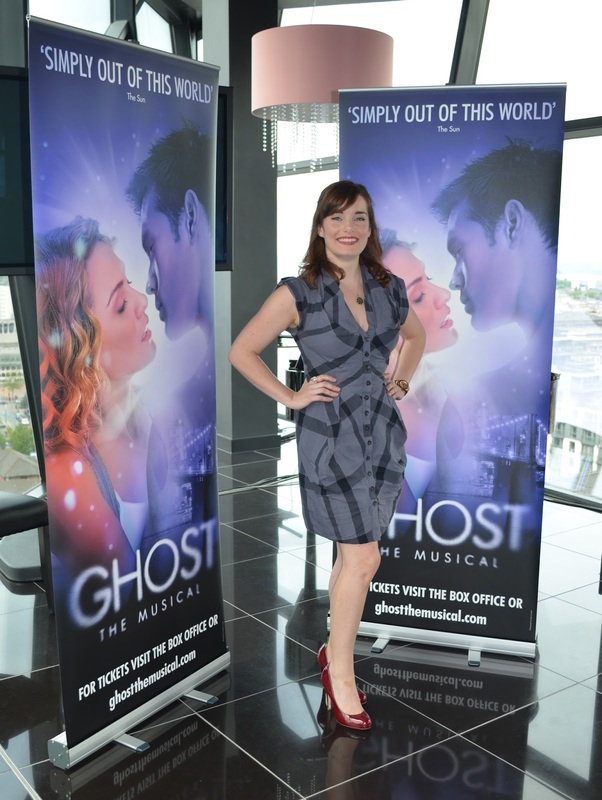 And what was it about Ghost, and specifically the role of Molly, that drew you to them as an actress? Well she’s such a brilliant character, you know. There’s this incredible arc and it’s a really meaty part, something to get your teeth stuck into. I kind of loved her strength in the face of adversity as well, and I saw the show and absolutely fell in love with it. That and the fact that she gets some stonking songs to sing. And in playing Molly, who has the love of her life ripped from her, you tackle some really weighty subject matter in terms of loss and grief. Now obviously loss is quite universal, but did you dip into any direct research when it came to bereavement, or speak to anybody in a similar position to the character? Ermmm, no, because it’s something that I have experience of, so I didn’t really feel the need to, to be perfectly honest, it was really close to home anyway, unfortunately. But hey, such is life you know! Now you originally understudied the role in London. How different an experience has it been stepping up to become principle Molly and taking the show on tour? It’s been wonderful! I was thrilled to be given the opportunity to play her full time. It is a slog and I’ve had to figure out how to pace myself in a different way I suppose, because the longest run I ever did in the West End playing the part was 2 weeks and of course you go hell for leather and by the end of that two weeks I was exhausted! So coming to this, I had to look at it again and go ‘Ok, where can I afford to pull back and make life a little bit easier for myself’. But I think all of us have found our feet and found the pace of it now because it is relentless for me and for Stewart [Clarke] and for everyone to be honest. of Ghost will be going live soon! It does look like an exhausting show to be part of, it really does. Yeah! And I mean poor Stu, he’s never off the stage, poor sod! But it does keep it fresh, taking it on tour, and you never get settled... You’ve always got a different set of challenges and a different feeling from the audience you’re playing for as you move up and down the country. Getting into the specifics of the show a little more, there’s a lot of times during Ghost where due to the nature of the story and characters, there’s a lot of action and dialogue happening on stage that Molly herself isn’t privy to. Is that challenging as an actor to shut all that out and just stay focused on what Molly can see and hear? (nods) It is very strange, and we did a bit of an exercise in the rehearsal room actually whereby the first scene with Sam, Molly and Oda Mae, where Oda Mae’s trying to convince Molly that Sam is there, we ran the scene taking Sam out of it, and Wendy [who plays Oda Mae] would just leave pauses where Sam would normally be speaking, and it was just brilliant and really useful for me because, although academically you know she can’t hear Sam, when you actually remove him from the equation it really makes you focus on what her natural responses would be if she was just faced with this mad woman who was apparently talking to herself! 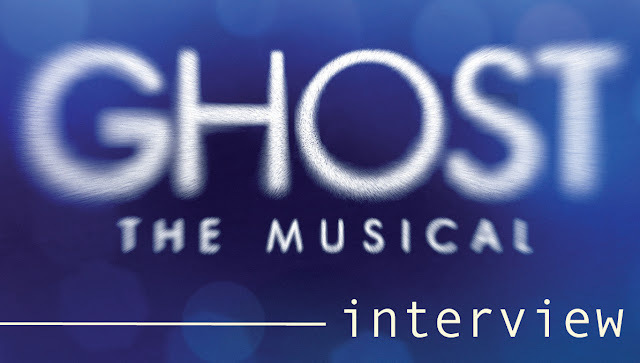 Now as well as the performances, Ghost is a really technically dazzling and ambitious show, and obviously yours and Stewarts and Wendy’s performances have to really ground it amongst all the visuals that are going on around you. What were the tech runs and prep for that like? It must have been pretty rigorous getting used to all that. Oh god, yeah. We had a very short amount of time to get it teched. We opened the show in Cardiff at the Millennium Centre which is a beautiful theatre and was brilliant as we had so much space but... it was a big ask, to get it ready in the timeframe, but we managed it... somehow... just about (laughs). And again, it’s probably a testament to the writing that I think all of us very quickly forgot all the technical stuff that was going on around us because you get so absorbed in the story and the experiences this character’s going through, and I certainly don’t feel like technical stuff is ever a distraction for me and I don’t think any of the others would say so either. Well I’m in awe of you all, because having done a little performing in the past I think if I was up on that stage I’d just be lost! Well it is strange! I’m dying to sit out front and watch it. I’ve not seen the touring version obviously, I saw it in the West End but I’d love to see what it looks like! Now am I right in saying you have watched the film before? Yes, but I was very young, I was about 8 or 9 the first time I saw it. Some of the scenes from the film, such as the pottery wheel sequence, have become fairly iconic now. How does it feel to be re-enacting moments such as that? It’s - I’m glad that I haven’t seen the film since I was a kid - I made a conscious decision not to re-watch it because you kind of don’t want that additional pressure hanging over your head, and I didn’t want to get Demi Moore’s performance stuck in my head. And again because doing it on stage in a big theatre is a very different scale, we don’t have the luxury of a close-up. And then again I think we’re fortunate in that the pottery scene, although of course it’s in the show, it couldn’t not be in it, doesn’t happen exactly the way you expect it to, which I think serves both myself and Stewart well and makes life a little bit easier (laughs). Speaking of Stewart, obviously the relationship between Molly and Sam is the pivotal heart and core of the show, so how has it been working with Stewart as the new Sam for the tour? Urgh, dreadful! (laughs) No, he’s wonderful, I just count my blessings, I really do, because as you say it’s pivotal and we would really be in trouble if we’d taken an instant dislike to each other but he’s wonderful. He’s nauseatingly talented and young and gorgeous and the nicest person you could hope to work with thrown in, and thank god we get on very well. ... but do you have any personal perspectives or opinions on ghosts, the afterlife and the like? I have to say... I’m a bit of a cynic. I don’t really believe in it, although I would love to! But... I just don’t. (laughs) I’m not gonna lie. A bit of a pragmatist? So last couple of questions, and aside from Ghost, what’s the most satisfying role you’ve played so far, and do you have any dream roles or projects you’d particularly like to be involved in? I always find it really difficult when people ask that because I get so absorbed in what I’m doing at the time. I understudied Rose in Aspects of Love a few years ago and that was a great character as well, she’s got this incredible story and she ages a considerable period of time during the show as well so that was a bit of a challenge. As far as dream roles go, I’d love to play the girl in Once, that would be a really great role. I saw it on Broadway, I haven’t seen it in London yet, but I’m dying to see it. And finally, in a nutshell, what can you tell audiences who are coming to see Ghost the Musical for the first time to expect? I would say it’s a timeless fantasy about the power of love, and there’s some incredible illusions thrown into the bargain. You’ll laugh, you’ll cry, you’ll be blown away by the spectacle of it all, hopefully, and you’ll have a really good night out! Well thank you very much for your time! Good luck with the rest of the tour and we look forward to welcoming you back to Birmingham in December when the show’s running at the New Alexandra Threatre over Christmas. I look forward to being here! Brilliant, thank you. Lovely to meet you too! NEXT TIME: Kyle interviews Ghost's leading man and local-boy-done-good, Stewart Clarke. Stay tuned to (A)musings on Facebook, Twitter and of course here on our blog as our VIDEO interviews with Rebecca and the cast of Ghost will be going live soon! GHOST THE MUSICAL will be running at the NEW ALEXANDRA THEATRE, BIRMINGHAM from Tue 17 Dec 2013 through to Sun 05 Jan 2014. For more information on the show's run at the New Alex and to book directly, click HERE.